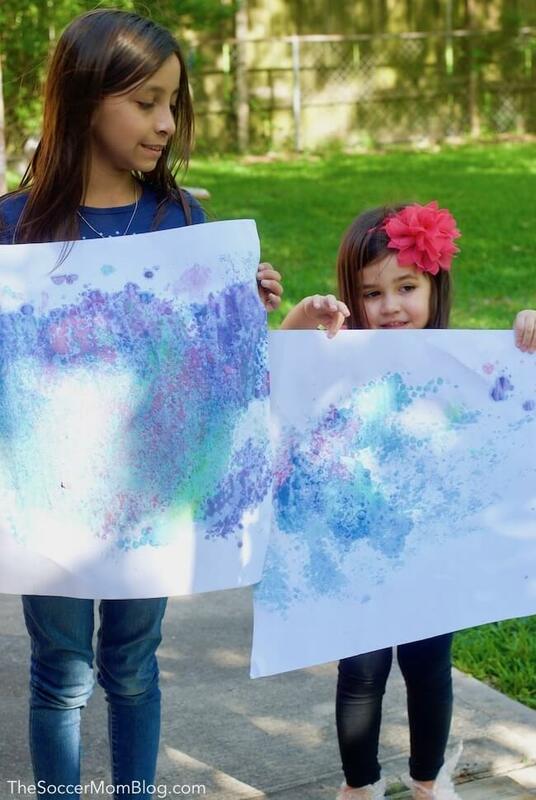 Get active and create vibrant art at the same time with this stomping bubble wrap painting! One of my girls’ favorite things to do is paint, whether it’s painting rocks with their Grammy or getting creative with their favorite (no mess) paint markers. 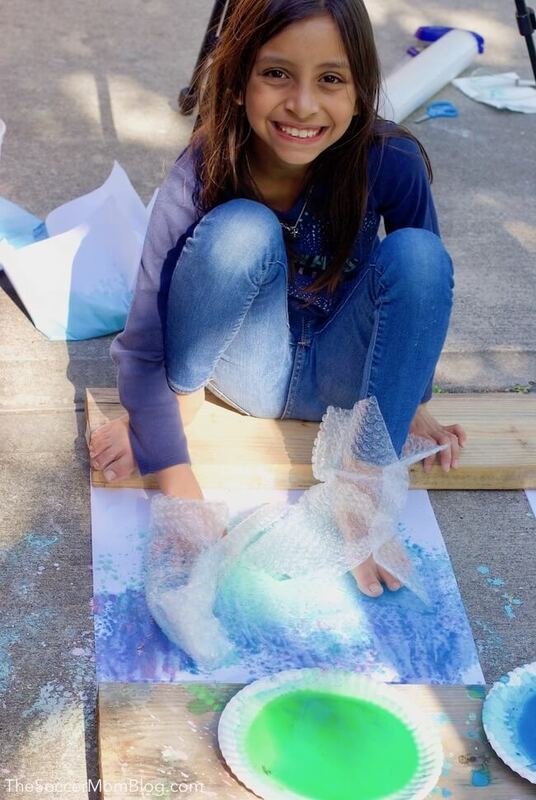 With the weather warming up, we decided to take our art outside — with stomping bubble wrap painting! 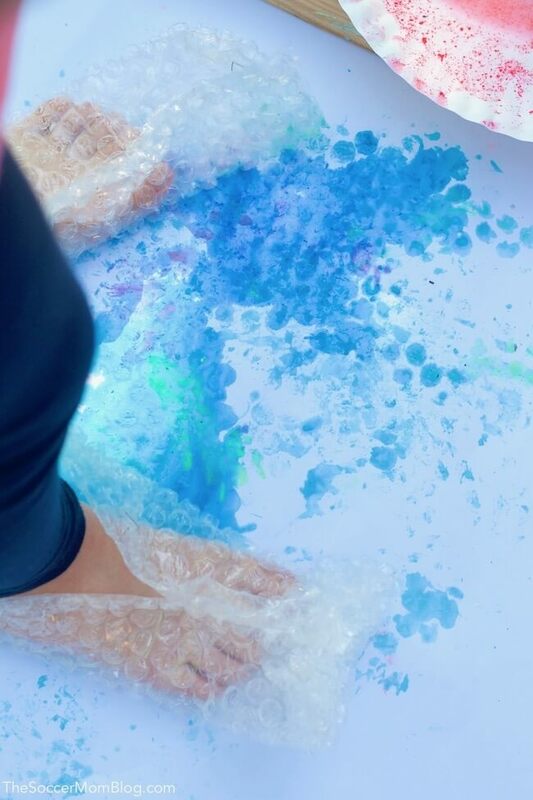 Just like it sounds, kids can stomp, pat, step, and smack paint all over poster paper with bubble wrap “booties” — and I think it goes without saying that this active art activity is a total hit! Related: For more sensory fun, check out our collection of edible slime recipes! 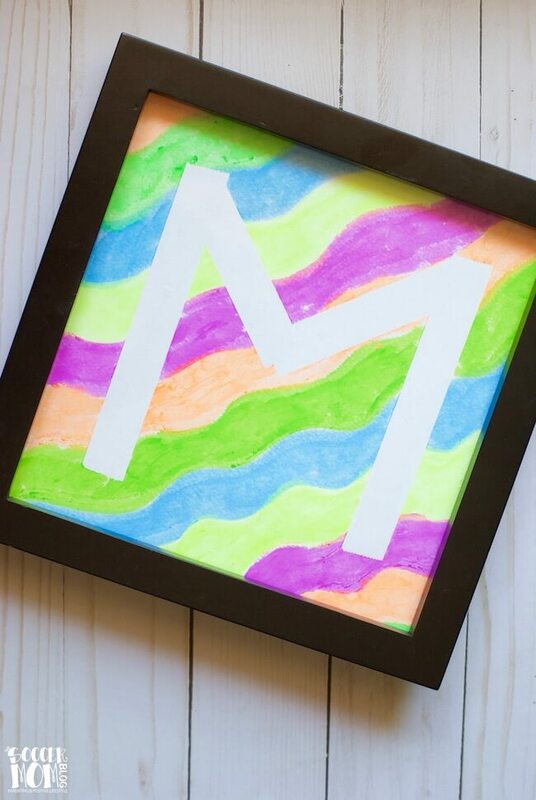 Watch the video below to see bubble wrap painting in action, then keep reading for supply list, homemade washable paint recipe, and step-by-step setup tips! For your convenience, I’ve included shop-able ad links to products used in our bubble wrap painting activity; disclosure policy available here. 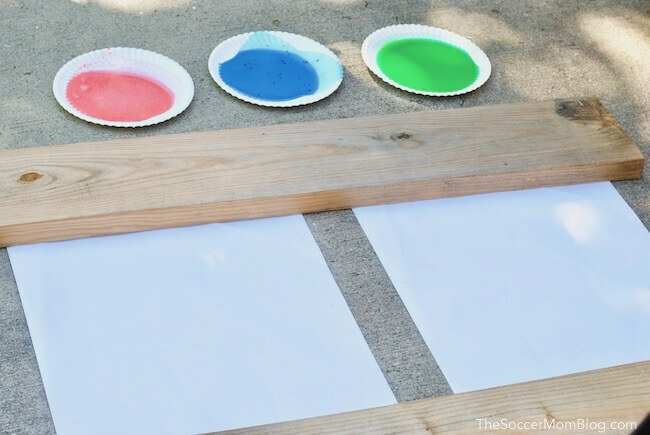 Since this activity is guaranteed to be messy, we used homemade washable paint as opposed to acrylic or other types which might stain our patio. Feel free to use your favorite store-bought washable paint, or use our recipe below. Whisk together 1/2 cup vinegar or water, 1/3 cup cornstarch, and 2-4 drops food coloring until well combined. You can increase this recipe as long as you keep the proportions the same. We did 3 different colors using the above recipe, and it made more than enough paint for both girls to stay busy for an hour and a half. If you have more kids, you might want to make more paint. PS- Click here to try our glow in the dark paint recipe too! We happened to have a couple long boards on our back patio that were perfect for holding down the edges of poster paper. You could also use chair legs, or whatever you have handy if it is a windy day (like it was here). We poured our homemade paints onto paper plates so the girls could step onto the plate to get paint on their bubble wrap booties and step right back onto their poster paper. TIP: If your poster paper is on the thin side, stack 3-4 pieces on top of each other to help prevent tearing. 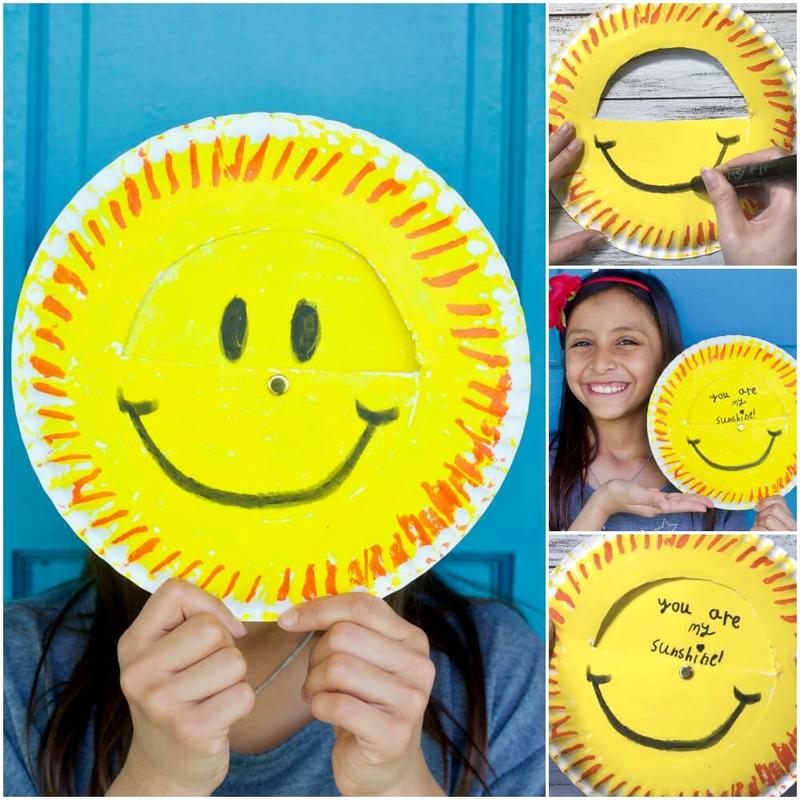 Matte poster board or even scrap cardboard will also work well for this activity. To make the bubble wrap booties, simply fold a sheet of bubble wrap to the size of your kid’s foot and secure the top and front so it forms a pocket. Strong tape should work to hold the booties together for a couple hours of painting. To be honest, we just left our patio as is to let the eventual rain clean it up! You can also hose off your patio when done. If paint gets onto hands and feet, simply wash thoroughly afterwards. Once the girls had a full bath later that night, almost all trace of the paint was gone. Just in case they got extra exuberant and splashed, I had the girls wear old play clothes.